Before a crowd of about 40 people at Memorial Church’s morning prayers, Faust spoke softly but firmly about an issue that could fundamentally change the way the College constructs its classes. 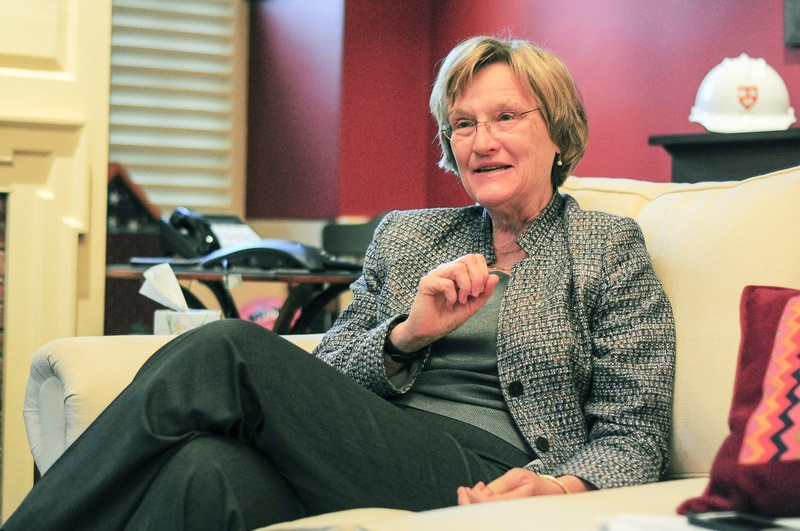 University President Drew G. Faust in 2014. Last year, the anti-affirmative action group Students for Fair Admissions sued Harvard, charging that it employs “racially and ethnically discriminatory policies” in its College admissions procedures. Six months later, more than 60 Asian-American groups also filed a complaint against Harvard with the Departments of Education and Justice on similar grounds. The Education Department has since dismissed that complaint. As part of her governing ideology, Faust has often sought to address even public issues behind the scenes instead of through the bully pulpit, but on Wednesday she did not shy away from issuing a charge of sorts to University affiliates. Lawyers for Harvard, who have consistently defended Harvard’s admissions policies, filed a motion this summer asking for a delay in the ongoing lawsuit until the U.S. Supreme Court hears again the case Fisher v. University of Texas at Austin, which deals with similar affirmative action questions. Both the Texas at Austin and Harvard lawsuits are funded by longtime affirmative action opponent Edward Blum.